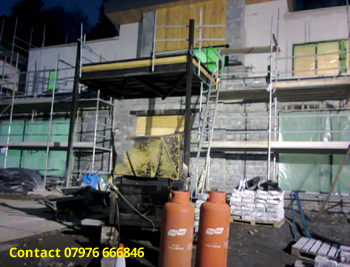 Four Balconies were installed at the Newly built 16 bedroom mansion for the Prince of Dubai on Inverinate Estate, Lochalsh, overlooking Loch Duich. Over five hundred miles from our base in Northamptonshire. 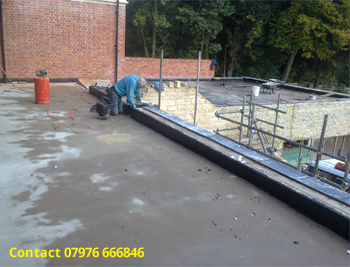 Polymer modified mastic asphalt roofing was specified for this project. 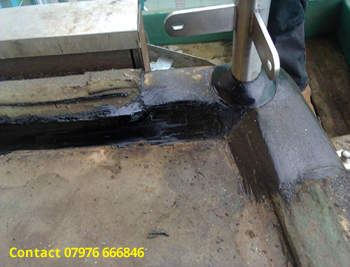 This gives increased thermal stability to the mastic asphalt in extreme weather conditions, amongst other benefits. 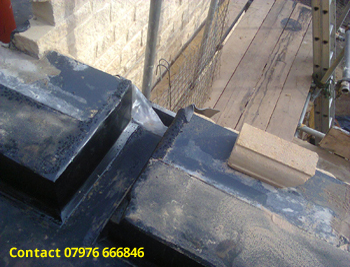 Polymer modified mastic asphalt detail to harmer outlets on all balconies. The main balcony covers the reception and dining room areas to the mansion. 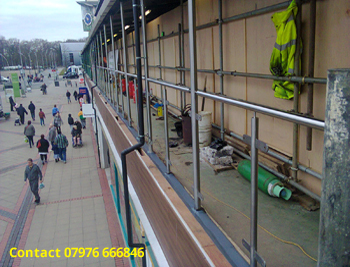 Main Balcony specifications included, insulation boards cut to falls 100mm average thickness on 2 layers torch on vapour barrier felt system to concrete base on high bond primer we installed 3 layers for good measure. 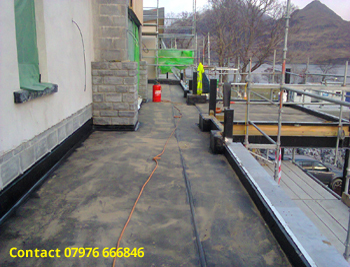 Then polymer modified mastic asphalt roofing grade laid to fall's on black sheeting felt underlay, sand rubbed finish with all up stands and fillets as required. 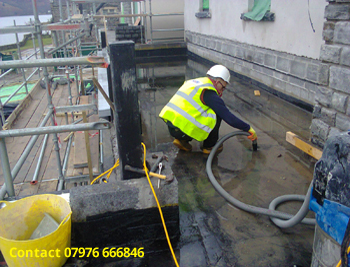 Carefully drying all areas to receive asphalt insulation. 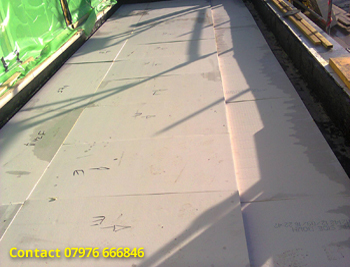 Enertherm PIR MG Insulation cut to falls glued to vapour barrier membrane. 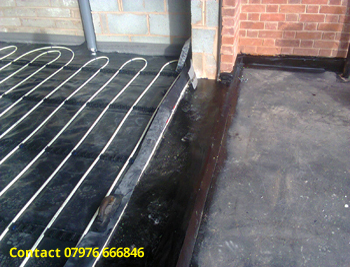 Gutter sole area laid first in polymer modified asphalt for good drainage to outlets. 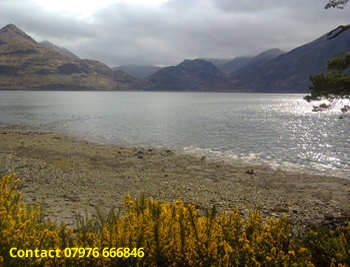 Winter warmth in the highlands! 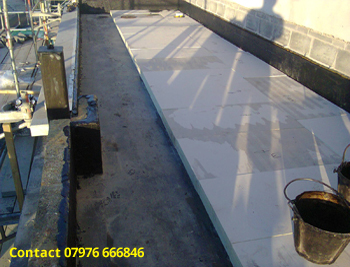 The finish surface will be decking on support pads with the polymer modified mastic asphalt protected from any form of point loading. 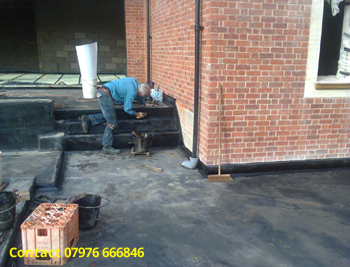 Alternatives can be tiles, slabs, rubber mating, synthetic grass and more, all with the correct underlay and support allowing the mastic asphalt the protection required. 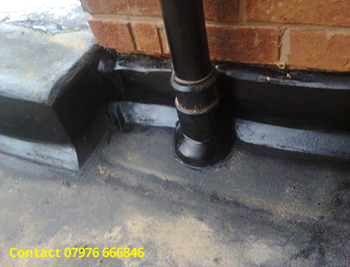 Details to down pipe though mastic asphalt. 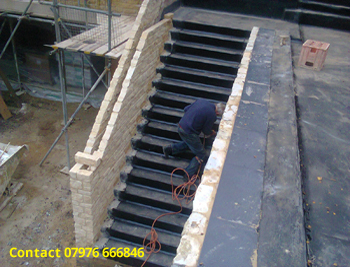 Steps asphalted in preparation to take slabs to suit stone work detail. 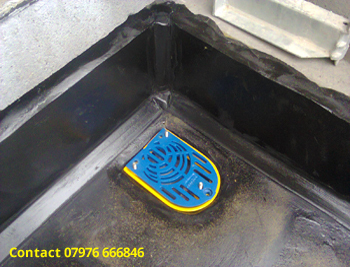 Shows mastic asphalt dressed to box outlet lead chute detail. 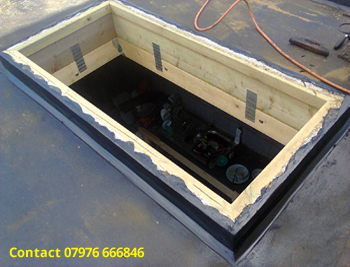 Shows asphalt up and over step to take patio doors they sit on top of the asphalt kerb, this is an important detail to give a watertight junction with the sills. 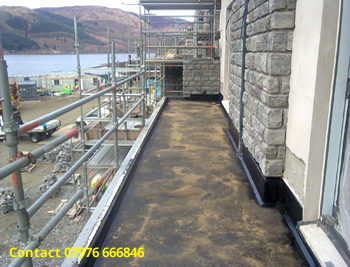 Mastic asphalt up stands and fillets applied to join both balcony levels. Higher level balcony looking down. The details above mainly on work for Peter Jennings LTD, Birmingham, award winning NHBC Builder.